Your grandfather and grandmother are playing chess, and you are sitting in the same room doing your own thing. A wide grin comes across your grandfather's face, and you can tell he is about to checkmate. Unfortunately, as he is reaching for the piece, he gets an important call on his phone. He asks you to take over his game for him. "You can checkmate on this move," he says. "Her knight would be able to block your queen, but it's already blocking the other one. Don't worry about her pawns, they're more of a hindrance than a help to her." He begins to walk away. "What a close game," he mumbles. "Same number of pawns... in fact, same number of pieces! Hm..."
What misfortune! Unfortunately, you know that all pieces are the same height (except for the pawns, which are shorter) so some pieces could be blocking your view of others behind them. Your grandmother, upon realizing your enigma, begins to cackle fiendishly. She does, however, tell you that there are exactly 8 pieces on the board. What does the board look like? What move should you make? NOTE: When I created this puzzle, I did not find all possible solutions, so there may be more than one. Also, "same number of pieces" does not mean the same number of each type of piece. Grandmother must have two pawns for the "Don't worry about her pawns, they're more of a hindrance" line to be sensible. That means Grandfather must have two pawns also. Each of course also has a King. That accounts for six pieces. The final two pieces on the board must be the White Queen and the Black Knight we see in the picture. That means the picture we see shows the four primary pieces already, and the only pieces not visible are the extra pawn each player must have. "You can checkmate on this move," he says. "Her knight would be able to block your queen, but it's already blocking the other one." 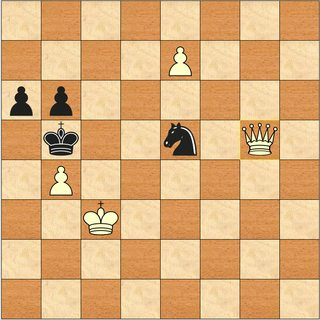 Black's Knight is pinned by White's queen on g5, preventing it from Nc6 to block the check by White's promoted queen. 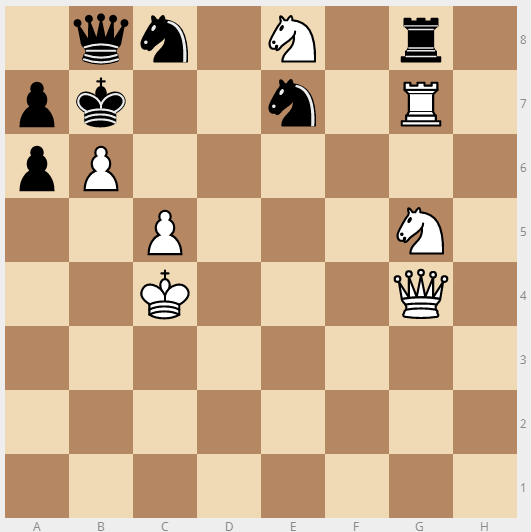 So it could block White's queen (the new one) but it's already blocking the other (queen). This is one way to do it, assumption is that 'equal number of pieces, and equal pawns' means equal numbers of each piece.